This Light Award is sponsored by Freedom Lifestyle Income Program and processed through Kiva.org. Malohat Boimatova has been engaged in this business for over 4 years. Her business place is located in the Kostakoz, Khujand, in Tajikistan. She is married and has 4 children. She sells children's clothes and men’s socks. 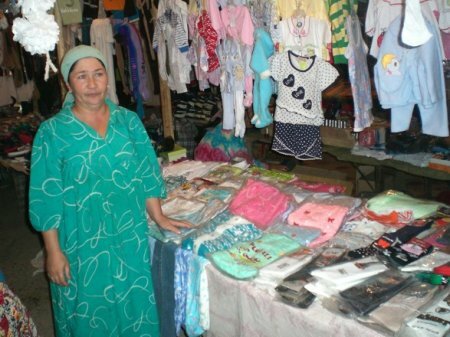 She brings her goods from Khujand herself. She strives to meet her clients' needs, and because of that, she has many clients. She became a client of MicroInvest in 2006. Her first loan was for $100. She used it to expand her assortment of goods. She changes her assortment according to the seasons. Now she has sold all her summer season goods and she is going on a trip to purchase her next batch of goods for the autumn season. She is going to buy 20 jackets, 30 hats, and 50 dungarees for children. To do so, she needs a loan of $1200.